This bow has a French origin from around 1720, clip-in frog and a weight of 45g. 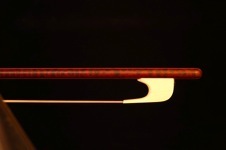 This bow has a French origin from around 1720, a screw mechanism, a weight of 52g and a length of 72,5cm. This bow is a copy of Dodd from around 1770. The weight is 55g. “Shortissimo” for early Italian music and Biber. The length is only 60cm, the weight 37g! 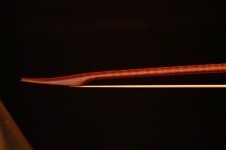 This is a copy of a bow by John K. Dodd from around 1785. Weight is 55g.